We all want to save energy, as this is a hot topic. It is good for the environment and for our wallet. But how? And where? Which devices consume the most power? And how do we overcome that annoying habit of leaving on the lights wherever we go? 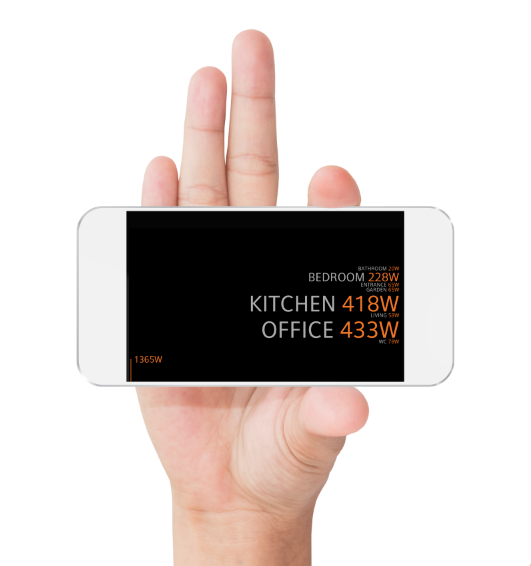 ONE Smart Control home automation knows what to do. The ONE Smart Control smart converter blocks and server accurately record your consumption and send that information to your app. You can see at a glance where to look for the biggest energy wasters. You can intervene where necessary. When you leave the house, by just pressing a button you can set the entire system to eco mode. All the lights will switch off and the heating will cool down by a few degrees. This way, no unnecessary energy is used in your absence. On your return, you will want your home to be comfortable. On arriving back home, you simply press the special presence button or you press “home” on your app and all the required actions are activated. Put your home “to bed” with a touch of a button. When you are fast asleep, why waste electricity unnecessarily on electrical devices that are on stand-by? Set your sleep mode in such a way that only the essential devices continue to function. You will be saving energy in your sleep. With the ONE Smart Control home automation system, you won’t need to think about your energy consumption. You programme the system to switch off all the lights automatically when everyone leaves the home. Not a single light can be forgotten. You can bet that your energy bill is significantly reduced. Do you always leave the light in the hallway switched on? In future, you won’t leave a single light on unnecessarily. You can switch them all off simultaneously with one click, thanks to ONE Smart Control. This will avoid unnecessary consumption by devices that have not been switched off. By not constantly heating your entire home, you will definitely save energy. Your heating is only on in the places where it is needed. We do not stop to think about it, but by lowering the heating by one degree, you will achieve a saving of a few percent on your energy bill. Dim your lights automatically and save power! Did you know that you can save 10 per cent energy by dimming your lights by 10 percent with ONE Smart Control? Set your atmospheres to automatically dim the lights and save energy, effortlessly. ONE Smart Control gives you the tools to check your water, gas and electricity consumption. View your historical usage online. This will show you what is happening and allow you to take action where necessary. In winter, sun protection helps to insulate and in summer it helps to cool. With ONE Smart Control, this happens automatically. In many homes, windows are seen as the weakest link in home insulation. ONE Smart Control can operate blinds and shutters, depending on the position and angle of the sun. More and more devices have a stand-by position. This often consumes more energy than we realize. Include these devices in your eco and sleep function and save energy.